It was windy in the park; I watched the surface of the reservoir ripple with a strong breeze as I followed the packed gravel trail around it. There’s something about being near the water that makes your heart feel so open and glad, even when you’re in the middle of a city. Often on Fridays I plan my run to finish up at the 96th Street farmers’ market. I turn right instead of left when I finish the reservoir loop, following the main road as it curves past the tennis courts, and jogging along the stately brownstones that line Central Park West. The blocks up here are crammed with eclectic-looking buildings, all pressed against each other—a prim-looking Tudor next to a spacious, modern townhouse with a domed roof. They’re so different that I imagine them as people with distinct personalities; for example, the pre-war brownstone would be a comforting grandfather in a slightly rumpled suit, eating the same steak dinner every night. Once I get to the market, I pull out the $20 bill I’ve tucked inside my pocket, and head straight for the blue awning of the She Wolf Bakery tent. I buy a quarter of a whole wheat miche and a full sourdough boule. Their breads are the best: long-fermented, naturally-leavened, high-hydration sourdoughs. The loaves have crackly golden crusts with a crumb that’s chewy and almost sticky inside. I toast slices and spread them thickly with avocado in the mornings. Today I skipped the market—I’m still working my way through last Friday’s loaves. Instead I came straight home to shower and dress quickly before a morning of meetings. Before my first call, I made myself an extra-frothy beet latte (beet powder mixed with oat milk and frothed in a milk foamer into a bright pink, fluffy cloud) and read a new-to-me Kim Addonizio poem that I’d stumbled upon yesterday. Here’s most of it (read the full poem here). Okay, the full poem is a little steamy for first thing in the morning, but it’s Friday! So, you know, why not? And that one line—“love’s merciless, the way it travels in and keeps emitting light”—is so beautifully and precisely written. You could do worse than to fill your day reading that sort of writing. Some things are like that: they’re so right, just as they are. They capture something that you couldn’t put your finger on—is it something you wanted? A void you didn’t know you had? A craving? Does it satisfy some nostalgia in you? Or maybe it just makes you feel good in some visceral way. An exquisitely written line of poetry can do that. Or the way a sip of cold milk tastes after a bite of chocolate cake. The opening rhythm of the song “Chain Gang” by Sam Cooke. The middle rhythm of the Fugee’s rendition of “No Woman No Cry”. The feeling of a perfectly worn soft sweatshirt. What would you add to that category? Here’s something I’d argue for adding to the “just right” list: the combination of walnuts and spice in a recipe. Walnuts are seriously underrated in baking—everyone goes straight for pecans or almonds (or hazelnuts, if we’re really being fancy, or macadamias if you’re feeling FLUSH), but that’s a shame. Case in point: The bakery next door to me puts walnuts in their chocolate chip cookies, a move that generally elicits raised eyebrows (or worse) from customers, but everyone comes back and lines up for more for good reason. What makes walnuts so good? For one thing, it’s the texture. Walnuts are softer than other nuts—when you bake them into a cookie dough or cake batter, they become even softer, offering a little chew with each bite. They have an almost buttery taste that works particularly well with sugar and spice. And if you toast them lightly first, they’re even more flavorful. If you’re like me, you’ll see the words “Spiced Walnut Cake” and think, nah, hard pass. It just doesn’t sound very thrilling, I get it! I know. But maybe you will trust me and try it, even if you don’t think you’re Team Walnut (um, not sure that team exists or who they play against, but you can still be on it). 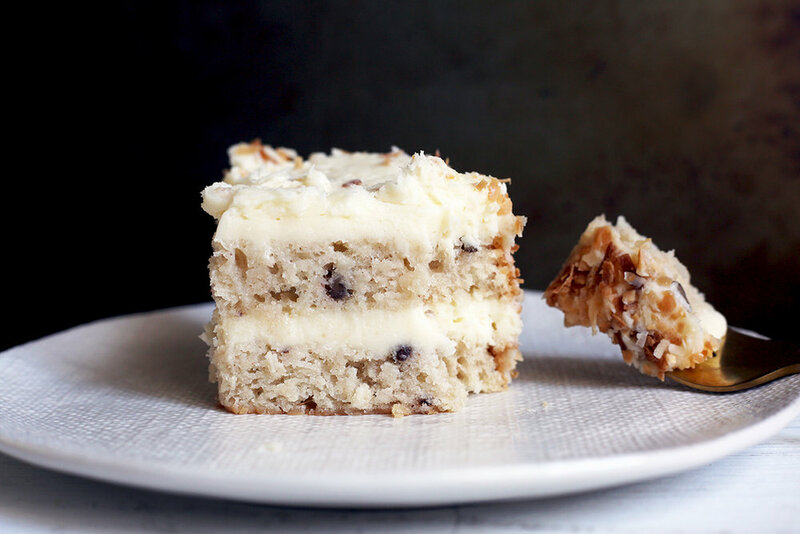 The cake is moist and with an extra-tender, oversized crumb…sort of like a banana cake might have or a simple spice cake. I top it with a cream cheese frosting—I always add Fiori di Sicilia (a vanilla and citrus extract with a Creamsicle-like flavor) or almond extract to my cream cheese frosting. You don’t have to do this, but I find that using one or the other makes the frosting much more delicious without imparting a discernible flavor. You couldn’t put your finger on the taste, but you know there’s something there. It also balances the sweetness a little. Preheat the oven to 350 degrees F. While the oven is heating, lightly toast the walnuts by spreading them on a baking sheet and toasting in the oven until they’re just barely golden brown. Set aside to cool slightly while you start the batter. Whisk together the flour, salt, spices, and baking powder. Set aside. Beat the butter and sugar together at medium-high speed until pale in color and fluffy. Scrape down the bowl, add the egg yolks and vanilla, and beat until well-combined. Stir in the toasted walnuts. Fold in the flour mixture and milk in three additions, alternating between each. Mix gently until the batter is well-combined. In a stand mixer (make sure the bowl is very clean! ), beat the egg whites with the whisk attachment until they have stiff peaks. Fold the egg whites into the cake batter. Divide the batter evenly between two well-greased, parchment-lined 8” round cake pans. Tap gently to level the batter. Bake for about 15 to 25 minutes (my cakes usually take about 20, but ovens vary so start checking at 15). The cakes are ready when a tester inserted into the center comes out clean, and the surface just barely springs back when touched. Remove from the oven and let cool in the pan for 10 minutes before flipping out onto a rack to finish cooling. If you want, you can freeze the cakes for 20 minutes or so before frosting them—I always do this with layer cakes; it makes them easier to frost when they’re firmer and less likely to shed crumbs. To make the frosting, beat the butter and cream cheese together until very fluffy (at least 4 minutes at medium-high speed in a stand mixer). Carefully add the confectioners’ sugar and Fiori di Sicilia or almond extract, and beat until the frosting is well-combined and fluffy. Liberally spread one cake layer with frosting, top with the second layer, and frosting the tops and sides generously. 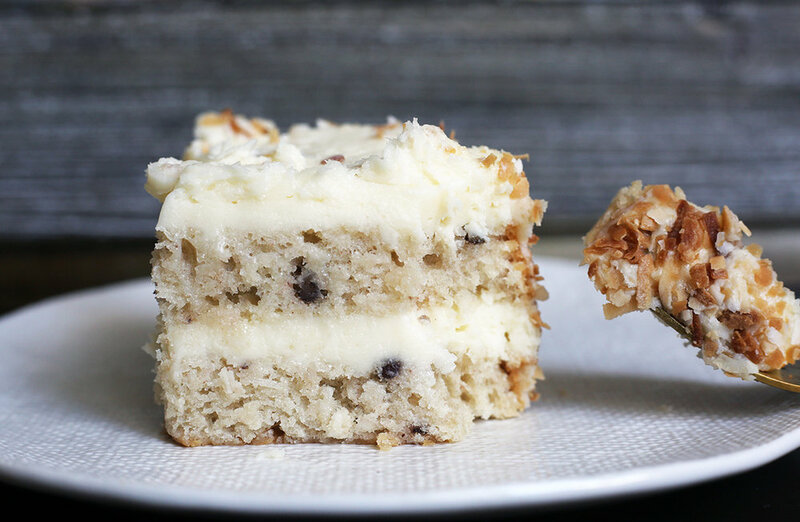 Press the toasted coconut gently into the frosting around the sides of the cake.